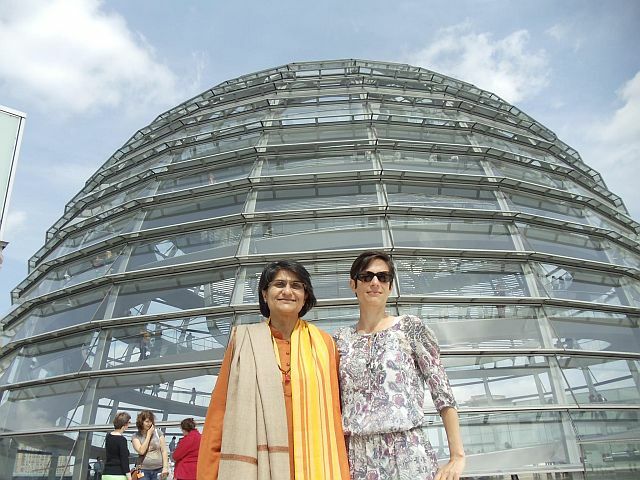 Dr. Isabell Lütkehaus works as a freelance journalist for yoga.info and ayurvedafinder.com. 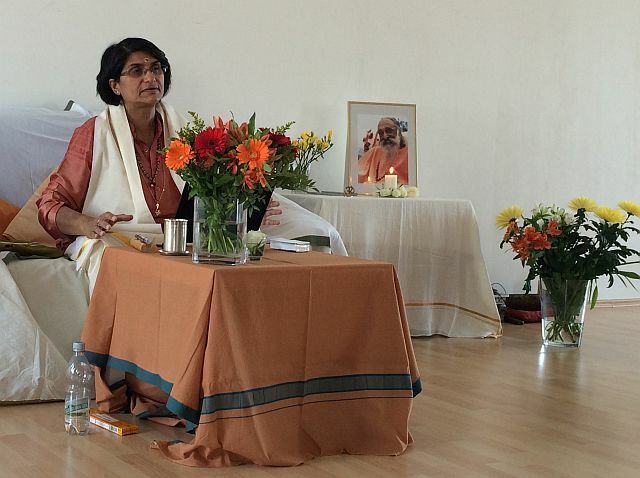 She recently had the opportunity to speak to Shubhraji, a direct disciple of highly revered H.H Swami Chinmayananda and the founder of the Namah Vedanta Center for Spiritual Unfoldment. 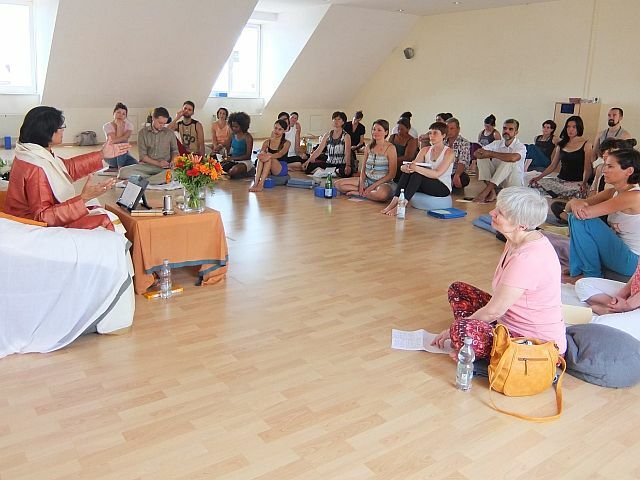 A teacher of spiritual studies and meditation techniques, Shubhraji was recently in Berlin, Germany for workshops and lectures on Vedanta. She took some time out from her busy schedule in Berlin to speak to Isabell. Shubhraji, can you tell us the core meaning of Vedanta? Anta is the end, Veda is to know and comes from the root word ved – the knowledge of the self. It is the end of all knowledge. It is that teaching which leads you back to your true nature. Is there a connection between Vedanta and yoga? Vedanta is the root philosophy of yoga; yoga is a philosophy and the word yoga also means the practical approach to discovering the self. All the ways to finding the self are called yoga: karma (selfless action) yoga, bhakti (devotion) yoga, jnana (knowledge) yoga, and the two philosophies have many things in common. What can I learn about today’s modern life from such an old philosophy as Vedanta? When I study Vedanta, I discover that the very basis of the entire creation is that one reality which is changeless. So Vedanta forces me to look within and discover that part which is changeless and understand that even though I have to go through all my experiences in life, ups and downs, they are in change, they come and they go, they are not permanent and I should not take them seriously, once I understand the changeless part in me. Therefore, it is a very practical philosophy. How can I change my daily routine to be more ‘vedantic’? When you start understanding yourself, automatically you change, because every moment is spiritual and you will approach it mindfully: you will approach it with love and you will approach it with consciousness. And to the extent you can do that you will be living the Vedanta and yogic philosophy in your day-to-day life, all the time. So it is a constant awareness. What is the best way to study Vedanta? The best way to study Vedanta is to directly hear it from a competent and compassionate teacher. Then, as a follow up, one can study it through books which are available everywhere. For beginners, I recommend the one which has been written by my teacher, Swami Chinmayananda, called The Manual of Self Enfoldment. We also facilitate study groups which are free and meet two times a month, where they read texts and discuss them. They are open to new students and you can find the list on my website or you can email us. How did you meet your guru Swami Chinmayananda? I met Swami Chinmayananda in Bangalore, India when I was 14 years old, through my eldest sister who is very spiritual. I had no intention of finding a guru, in fact, I was an atheist. My sister introduced me to him and immediately something connected. Then I went and attended his Bhagavad Gita lecture, where I was one person in a crowd of 10,000 people and I was so mesmerised by his command of the language and the way he explained things that I got completely attracted to his teaching and his personality. I learned slowly over a period of a few years. I was very committed and drawn to his teaching. At the beginning, when I met my teacher, he was more like a father figure to me because my father had passed away when I was very young, so in him I saw the compassion and the love of a father. It was only four years after I met him that I truly realised that he was my guru. Just then it really hit me that he was my teacher. Have you adopted daily rules and routines for your life from Vedanta? I have my personal sadhana which is my meditation and being in silence. However at this time of my life, I am constantly in contact with that divine source so every moment is a practice for me. Vedanta is so universal and each one is advised to live according to their nature (prakruti). Of course, I am vegetarian. Personally, I don’t put down any strict rules for myself. I do certain disciplines: once a year I practise silence for maybe two weeks or a month. On a daily basis when I am teaching, I refrain from eating onions and garlic. Not because, as other yogis say, it is rajasic or leads to desire, but because personally I find it is much easier to sit and the prana (life force) flows easily. My routine varies from day to day, as I travel and teach. In each city the routine is slightly different depending on the times of my talks, so I do not have a fixed routine for teachings. Other than that, the only rule I have is to really live in that connection with the divine and to come from love. Because no matter how much knowledge we have, if we cannot act out of love, this knowledge is just book knowledge. I personally believe in flowing naturally and being very alert to keep and check where the mind is losing its energy and bring it to the centre in all our interactions. For an introduction to Vedanta, see Shubhraji’s article ‘What is Vedanta’ on the yoga.in blog.